An RSS feed (or news feed) is a means by which you can stay informed about what's going on at Hilton Head Shore Notes without having to regularly visit the website. 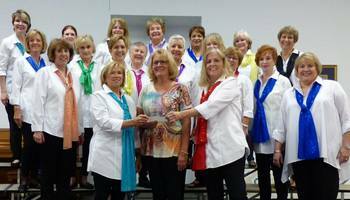 Hilton Head Shore Notes is an extraordinary group of women who gather together to sing 4-part a cappella harmony. We are a chapter of Sweet Adelines International, and we sing Broadway, theater, pop, standards, swing - any song that can be voiced in four parts, and that's just about everything! We currently have over 30 singers of all ages and all walks of life. All our rehearsals are open to the public and to potential new members, so why not pay us a visit. You'll have the opportunity to hear us perform four-part, a cappella harmony, and you'll be invited to join us on the risers to experience the music, friendship and fun! 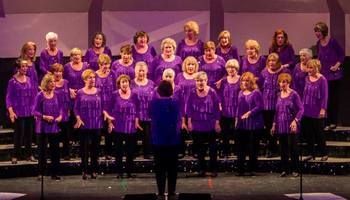 We rehearse Monday evenings at 6:30 pm, at Island Lutheran Church, 4400 Main St, Hilton Head Island, SC. Want to join our chorus? Want Hilton Head Shore Notes to sing at your next function? Why not hire Hilton Head Shore Notes to entertain at your next event? We can perform at corporate functions, charity events, community Entertainment events, birthday parties, christmas parties, awards nights, weddings, engagements, anniversaries, and even funerals and memorial services.